Do you and a special guy or gal enjoy a speedy trip or two down the hill before heading home to hot chocolate and snuggles? Capture the memory of thrills and spills shared together with the adventures in sledding -couple Christmas ornament from Russell Rhodes. This is a personalized couples ornament, so we'll add your information where shown, but in a very stylish font to create a keepsake that is one of a kind. There's room for us to add a longer message when you select that option. 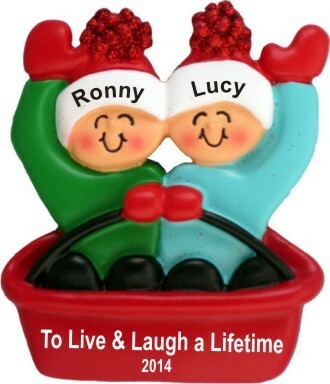 The sledding couple personalized Christmas ornament features a festively dressed and happy pair and your custom message, and it ships in our class velvet gift bag.